Overhaul – MoonFigures Collection, Art, and Reviews! So I’m doing some overhauling! If you haven’t noticed, I go through a LOT of different templates. Thing is, you might NOT notice because the template is usally laid out the same way. The big difference is normally in the header, menu, and width of the page. Some of these might change size, shape, or font. At this moment, I THINK this template will stick. It’s wide, the menu buttons are accessible and don’t hide at the bottom of your browser anymore. 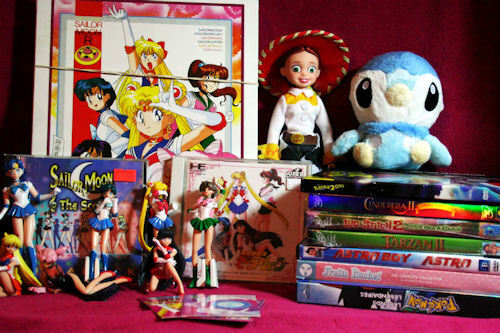 The overhaul will be more obvious at the main Sailor Moon page, where I’ve included some old collection shots, as well as some info about my collection. If you look at the Plushies page you’ll see that I’ve begun adding content to the “inbetween pages”. There is something similar on previous pages, but I’m not at all happy with it. I added a meeting and autograph session with Australian singer Kate Miller-Heidke a couple months ago, but never posted it here. Added a Sailor Moon PC Engine game tonight. Edited the Classic SM Uncut DVD review, as well as the SM R Uncut DVD review. And probably a lot of plushie stuff that wasn’t there before. I found these beauties somewhere between the East Meets West Festival in Edmonton, a game shop, HMV, Walmart, Value Village, and a flea market on 111 avenue here in Ed. I also got 2 more North American puzzles with the Korean one, but I already had them. Oops D= Oh well, they were a dollar each lol.